On a recent visit to my daughter's house for supper, we were served cocktails in a jam jar - ''It's all the fashion now, Dad'', she said. Well, it's a fashion I won't be buying into despite jam jars being so cheap! 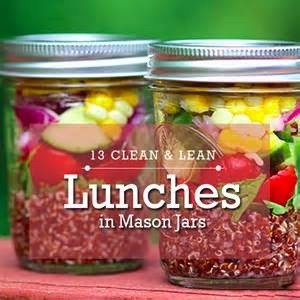 However, I now read that 'lunch in a jar' is the new food fashion with the latest edible trend being salad in a jar - the new practical, portable lunch with a healthy fashionable following. Why? 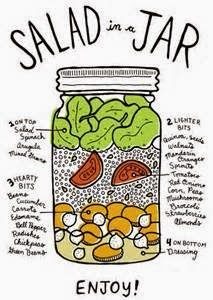 Because jam jars, or 'Mason jars' if you want to stay on brand, are air-tight, crafty little portion controllers, odour-free, and best of all prove a nifty way to avoid soggy-salad syndrome (if you put the dressing in first, then layer veg on top, the salad remains undressed until you mix it up). 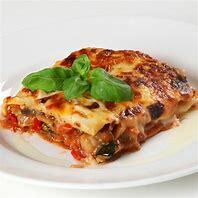 Plus, they keep longer, so you can prep your meal the night before. 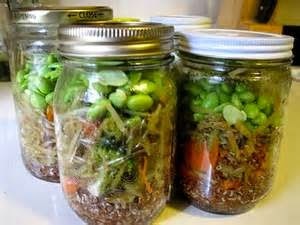 Wellbeing hipsters are all a buzz with the idea of using said jars to create fermented salads too (try mixing cabbage, carrots and peppers with salt, allowing to sit for five minutes to extract moisture, and allow to rest - crucially in an air-tight jar - for a week). Said to increase our gut's good flora, fermented salads encourage a healthy digestion, better vitamin levels, helpful enzymes and antibiotics, which together pack one hell of an immune-boosting punch. In the USA, 'Mason jar' lunches are old hat and 'US food trendies' have been throwing their Goop salads into jam jars for a while, but fresh to the UK, we suspect that a vegetable-packed jam jar is coming to a desk near you. (And by the way, if you're not a jam fan, you can easily find a suitable vessel online with the Mason Jar at £4.97 or a Kilner jar, which are £8.99 for three at Lakeland). 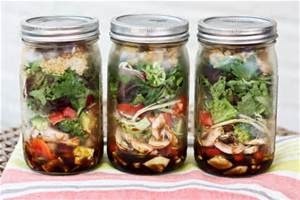 If you did fancy the idea of lunch in a jar, fermented or otherwise, so advanced is the meal-time phenomenon that it's now even got its own Pinterest board for recipe ideas,see below (www.pinterest.com). So step away from Tupperware, plastic and polystyrene, because the future of the DIY lunch is clear as glass. Cruising - Avoid Putting On Weight!